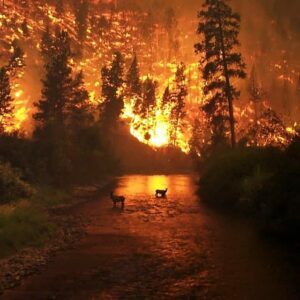 California experienced a catastrophic wildfire season in 2017, with both the largest wildfire in modern history and the most destructive wildfire occurring within months of each other. On December 4, 2017 the Thomas Fire erupted in Ventura county and ended up as the largest wildfire in modern history, in terms of acreage burned, destroying over 280,000 acres in Ventura and Santa Barbara counties before it was contained. The Thomas Fire also destroyed over 1,000 homes and businesses. On October 8, 2017, the Tubbs Fire began in Sonoma County about 12 miles northeast of the City of Santa Rosa. Fueled by Diablo winds and extremely dry conditions, the Tubbs Fire exploded in growth toward Santa Rosa. By the time it was contained, it had caused 22 deaths and destroyed almost 6,000 homes and businesses in Sonoma and Napa counties. The Tubbs Fire is the most destructive wildfire, in terms of structures destroyed, in California history far surpassing the Tunnel Fire in Alameda county which destroyed 2,900 structures. There is strong evidence that both the Tubbs Fire and Thomas Fire were caused by improperly maintained power lines. Over 95% of all wildfires in California are caused by humans and power lines are a common cause of such fires. This is one reason California has strict regulations on power line maintenance to minimize the risk they will spark a wildfire. The Doyle APC lawyers have extensive wildfires litigation experience having represented a large number individuals whose homes and business were destroyed by the 2007 Witch Creek Fire which destroyed approximately 2,000 structures and almost 200,000 acres in northern San Diego county. The Witch Creek Fire destroyed homes in some of San Diego’s most exclusive areas like Rancho Santa Fe where countless multi-million dollar homes were destroyed. As suspected in the Tubbs and Thomas Fires, the Witch Creek Fire was caused by improperly maintained power San Diego Gas & Electric (SDGE) power lines. The result was a massive litigation against SDG&E in San Diego County Superior Court. The Doyle APC attorneys successfully resolved a large number of these cases. Wildfire litigation is extremely complex. Countless experts are needed to prove liability including meteorological experts, wildfire investigation experts as well as experts in power line maintenance. But more importantly are the experts needed to establish a homeowner or business owner’s losses. This includes builders to ensure the repair or rebuild costs are adequate, arborists, erosion experts and landscape economists to ensure the cost to replace lost trees, plants and other landscaping are appropriately calculated. The Doyle APC attorneys have relationships with the experts needed to litigate wildfire matters. If you, or a family member suffered a loss from the Tubbs or Thomas Fires, you can call the wildfire litigation lawyers at Doyle APC at 1-800-736-9085 for a free legal consultation or fill out our online form.